This fast-acting surface clamp can be used with a Festool MFT/3 table top or anywhere you can drill a 20 mm diameter hole. 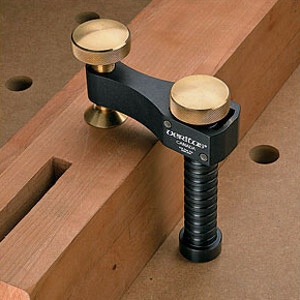 The post has a wedging mechanism that anchors it firmly (horizontally or vertically) in material as thin as 16 mm (5/8 inch) (depending on the strength of the material), making it also useful in jigs and fixtures, e.g., sliding tables for saws. 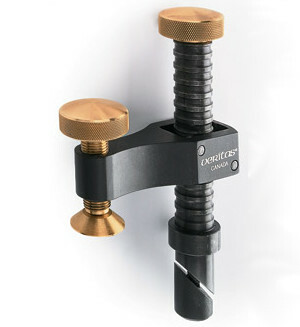 The clamp arm (which slides easily on the post when tilted, but locks at 90°) has a 54 mm (2-1/8 inch) throat depth and can grip anything from veneer to material up to 95 mm (3-3/4 inch) thick 79 mm (3-1/8 inch) when the post collar is used as a depth limiter). 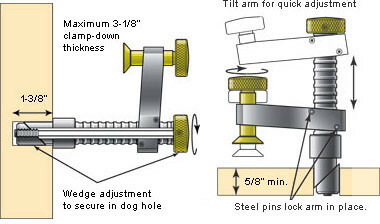 Anchor wedging is controlled by the brass knob on the post and clamping force by the knob at the arm tip. These 20 mm hardened steel bushings help you make an accurate dog-hole drilling guide using any 38 mm (1-1/2 inch) thick board. 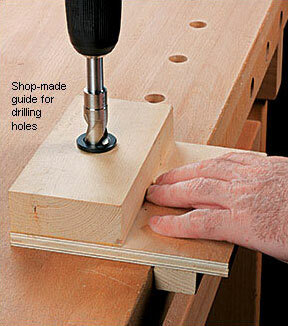 For drilling the dog holes, we offer 20 mm drill bits that are 200 mm long overall, enough to go through the jig and a thick bench top. The lipped brad-point style scores the perimeter of the hole for clean entry and smooth sidewalls.